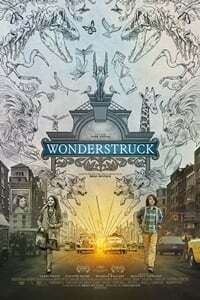 Wonderstruck: It’s a wonder that poor little Rose (Millicent Simmonds) wasn’t struck down by the train of coincidence. Two deaf children, separated by five decades and both searching for the same thing, are flattened by a train of coincidence in Wonderstruck, the latest period(s) melodrama from director Todd Haynes (Far from Heaven, Carol). The Starsky and Hutch poster hanging on Ben’s (Oakes Fegley) bedroom wall announces the time frame long before the “1977” descriptor appears across the screen. We first encounter Ben at a moment in the boy’s life that finds him ripe for the orphanage. Mom (arrive late and you’ll miss Michelle Williams’s cameo) has died, refusing to tell her son anything about his father’s whereabouts. “It’s never the right time,” bellows Ben. But who needs Mom when, as luck would have it, screenwriter (and author of the original novel) Brian Seltzer has inserted a critically placed bookmark in the even more crucial titular guidebook in order to set his preposterous parallel tales in motion. After an electric shock causes Ben to lose his hearing, the lad flees his Duluth hospital bed and hops the nearest Greyhound to New York. Flash back 50 years to Hoboken, where a newspaper clipping, prime for one of Rose’s (Millicent Simmonds) bound scrapbook collections of Lillian Mayhew (Julianne Moore) memorabilia, leads the youngster to a legitimate theatre currently hosting a play starring the toast of Broadway and the silver screen. Wouldn’t you know it? What are the chances of Rose visiting the cinema on the same day that silent cinema died and the Vitaphone sound-on-film system is just being installed! Dartboard transitions initially serve as linking devices between the two periods; a shot of Ben stepping on a ferry is preceded by Rose setting afloat a paper boat with S.O.S. pencilled across its portside. But about a quarter of the way through, Haynes’s artsy-fartsy juxtapositions give way to a series of simple, less-exhausting straight cuts. One thought that came to mind during the film’s opening escapade: do deaf people dream with closed captioning? Do not try and adjust your screen. In order to give audiences the full “deaf experience,” the closed captions are burned into the DCP. Haynes even goes so far as refusing to subtitle sign language. As a respectful tenant who enjoys watching movies well into the wee small hours, I’m used to closed captioning: I frequently hit the CC button so as not to disturb my neighbors’ slumber. (Though gosh only knows how one can make it through a Cockney kitchen-sink drama without the aid of CC.) Accustomed as I am to the appearance of writing across the bottom of the screen throughout the duration of the picture, it never once gave pause for wonder. And don’t blame the closed captioning for getting in the way when it’s Haynes’s selective hearing and Dolby Deaf sound mix that are the real culprits. If it was the director’s goal to reproduce the “deaf experience,” shouldn’t the entire film have played out in silence? Of course not! Silent movies were never intended to be exhibited without sound. From a sole piano player to a full symphony orchestra, there was always some type of music to underscore the ribbon of images. Haynes respects this, as the accompanying music and sound effects during Rose’s segment are all provided by an orchestra with no added outside noise. The same rules clearly do not apply to the tone of Haynes’s semi-audible ’70s. Haynes is also guilty of turning a deaf-eye to the visual look of his flashback sequence. Widescreen lenses wouldn’t be brought into play for at least another 25 years. Stickler, schmickler: there is no excuse for shooting Rose’s story in the same anamorphic aspect ratio as Ben’s. Haynes clearly wanted to pay his respect to silent cinema. Were that not the case, he would have shot the entire film in color. When Rose attends a matinee showing of one of Lillian’s movies, the image on screen is properly masked in the Academy Ratio. Why the entire sequence doesn’t follow suit is a question only the director can answer. Not more than an hour in the Big Apple and a fleetfoot homeless guy steals Ben’s cash, leaving the kid alone to wander 42nd Street. The next day, while in search of the store that corresponds to the bookmark, Ben just happens to meet up with a kid who just happens to be the son an employee who just happens to work at the museum that houses the key to the puzzle. I scribble on my notepad, Night at the Museum 4: Revenge of the Flukes. Moore reappears in the color sequence, but so as not to be labeled a spoiler, I won’t reveal in what capacity. Let’s just say that Ben awakens in the bookstore to find Moore and the shopkeeper (Tom Noonan) lording over him. The two purposely don’t reveal their true identities so that Seltzer can keep the audience in suspense. That’s really unfair to frightened Ben. And for a film about the deaf community, there is enough rapid-fire verbal exposition doled out during the last ten minutes to make a sign-reader’s eyes smoke! There’s much in here — silent cinema, the 1964 New York World’s Fair, 42nd Street before its Disneyfication — that I enjoyed seeing re-created on film. Just not in this film.